Actually, with a little further investigation, it looks like the TORG series of books I'm remembering are just novels based on an RPG supplement. I saw them around but never clued into them just being novels, I guess! Got that copy of Forest Of Doom in the mail just before Xmas - in tip top shape (someone had laminated the cover so it was well preserved). Finally had time to open it up, roll my character stats & have a go at it. SOO MUCH FUN. I remember so many of the encounters from back in the day... it was seriously tickling my nostalgia-bone to read through & game it! Thanks for starting this thread & reminding me to revisit an almost forgotten favourite thing from my youth, 'Tuga!! Ha, don't mention it, very happy to see another old Allansian finding its way through Darkwood. One hilarious bit about this book in particular (and quite telling of how undeveloped the gaming system still was- this is the first book by Livingstone alone) is that you can play it forever without dying, if you have high stats- and I always do, Skill 11/12 Stamina 22/20 and Luck 10 to give it a bit of challenge; I think that an Allansian adventurer with a rep would not be a Skill 7 guy. That's maybe an Orc skill number But Luck is luck and since the penalties are often not as bad... I roll with it. The book asks you if you have both halves of the Hammer in the "finishing line"; if you don't have them, it gives you the OPTION of going back to the beginning and try again instead of good ol' "Your adventure ends here." I love the illustrations on this one, but its the McCaig cover that blew my freaking 10 yo self. I love it so much. You want to experience a TRUE nostalgia kick then hear me: there's a later book in the series (#50) that is called Return to Firetop Mountain. If you recall, Warlock of the Firetop Mountain is the very first FF book. This sequel is an actual return to the place; you'll find rooms that were filled with Goblins just destroyed and so many other vestiges of the first book. I actually played it for the first time EXACTLY 10 years after the last time I had played WotFM (around 14/15), which is the number of years that have passed in-story. I hold many great memories of that adventure even if I played as an adult. Double nostalgia punch!!! If you want me to suggest you some more-evolved books of late in the line, just say. I know that everyone loves the early classics, but FF really got better in the dice/gaming bit dept with time, although not kid-friendly at all in that aspect. Some books are literally impossible to finish unless you have maximum stats and just the biggest luck in the world, like Crypt of the Sorcerer (a nightmare to finish) but others rely on more "mature" writing, the lore of the franchise and "mood". These are my fav reads, not counting the nostalgia the early ones will always have. The stuff by Stephen Hand is all TOP. And you have to read Creature of Havoc, the last Steve Jackson (NOT the Munchkin guy, although he did write ONE Fighting Fantasy book- Scorpion Swamp. Its one of those trivia things.) book, I swear it is awesome awesome awesome. And of course, Sorcery! the mini series where you have to memorize spells and can play as 2 different classes. I can't find my maps right now but when I do I will post it here, like I said, promise. And btw, I'll soon send you a copy of one of my books that I have a spare english edition- Phantoms of Fear, it is a great book with great art. There were other table top RPG companies Paladin Press had Robotech, Macross, Star Wars, and TMNT (I know they had the first two and I think they had the latter but I'm not 100% sure of it. You mean Palladium Books, and yes - they have Robotech/Macross & TMNT, but never had Star Wars. Originally it was West End Games that had the rights to Star Wars RPGs & published a ton of supplements, but currently it's Fantasy Flight Games who is publishing SW RPGs, with their own rules system that is separate from the old WEG stuff. Last edited by grendeljd on Sat Feb 03, 2018 6:28:59 pm, edited 1 time in total. Yes!! I made one pass through & only found the head of the hammer - I had forgotten it let you go back through, so long as you Test Your Luck & pass to avoid being killed by the hillmen. And yeah, I rolled really high on my stats - 12 skill, 20 Stamina & 9 for luck [not great]. Once I started picking up magic items & weapons, the hit roll bonuses got to a point where most of the creatures encountered couldn't match my lowest possible skill/attack rolls. So automatic kills for the most part - still tons of fun regardless. DUDE. That cover was immediately mesmerizing when I first saw it as a kid, and its still as awesome to me now as it was then. LOVE it. I was lucky enough that my mom generally would buy me any book I asked for on the spot when I was a kid - so I got this one right away. Oh, thats really cool! I never read/played Warlock Of Firetop Mountain back in the day - that would be fun to get to play through both books. Cool dude, I'll check out Creature Of Havoc. Let me know all your favourites from the more mature era of the books - I will try to pick one up the odd time as the mood strikes me. I am kinda thinking about tracking down the rest of the SORCERY! books. I haven't gotten into re-reading Shamutanti Hills yet, but the idea of this line is really cool. Dude, thats awesome, thanks! That book looks super cool. Ok, better late than never, so here's a sample of my map book, still a WIP (in 2007, i threw away all of the maps I did in order to make me play the books again. Dumb move. ). And yeah, I write in english. And the second half of the map, this book big. Am I the only one who can't see the maps in the thread? I get that image symbol whateverthatis. Anyway, some "good news" from the Fighting Fantasy front, brought to you by this old Khulian rabbit-skinner - any Chaos of Malice fans here? Ok. Moving on. 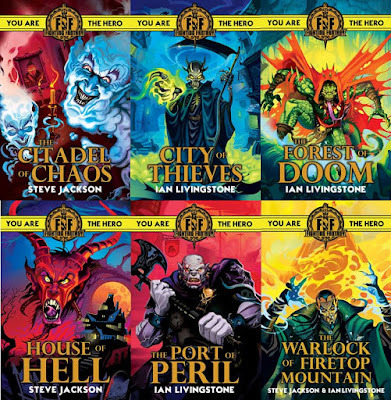 Scholastic books (the guys that started reprinting FF last year, in a new TPB format) have announced the next batch of books- and here comes another NEW adventure, written by a new author "Gates of Death" by Charlie Higson). This is a case of a fan of the books being given the chance to write a brand new adventure. Jonathan Green did this both in the later run of the OG line (Spellbreaker), and he also is the author of the more recent non-Livingstone works, whisch I reccomend to any fan. He's way more interesting as a writer than 3/4 of all the writers of the series. His "Howl of the Werewolf" is actually regarded (according to a poll published in the Fighting Fantazine mag) as the very best FF book that ever saw print. I own it but I have never played it because I don't want to run out of GOOD new FFs to play before I die, lol. Also, Sorcery! is being reprinted again, something that hasn't been done in 15 years. Wow, my "new" books are now almost "vintage". What bothers me about these relaunches are the new changes to the looks of the books. They both looked good enough to me, honestly, and they both do have an 80s feel to it. Problem, is they are completely different. 1st worlder problem here!!!!! I have to confirm if the spines are the same, and if the first wave will be soon replaced by this new look. I read in their blog that current french editions of these have those pre-made characters that someone thought was a good idea for the Wizard re-reprinting of FF. But they all contain info about Allansia, its more famus denizes, places, creatures, etc. Kinda of a Monster's Manual/Player's Handbook mini-mash. Last edited by ShadowTuga on Mon Feb 18, 2019 2:18:40 am, edited 2 times in total. I still have to go and get the LW novels. I "know" that they are very good, almost, due to the praise they had among my buds at the Tower of the Sun site. One of my best pals there was actually a novels-only fan. He played the main series, but he really, really loved the novels. These also have new characters and what not, I really have to get them one day. I also have a copy of the Magnamund companion, its a phenomenally entertaining book for Lone Wolf fans, with just fantastic art all around- and that's a great price, btw, so congrats! I have seen that guide go for 30/40 pounds, had it in my mind that is the regular secondary-market price for years. Ok, first: I started playing Howl of the Werewolf tonight, died with the main baddie because of Lack of Stuff. I was expecting since I went straight to the guy, not worrying that much about exploring. I am loving this book. Loving it so damn much. Werewolves are a hit with me, and horror fantasy (think Ravenloft) is another hit. Two big reasons I was hyped for this book, but probably the main one is the fact it was considered by fans in a poll almost 10 years ago to be the very best FF book ever. Ever. I can not say that, but I have the feeling this will be a top 10 for me. I only layed it once and it feels like there's a LOT to do, but you don't need a narrow path to win. PERFECT combination in a gamebook. I have been holding on playing it since publication (2007), because Werewolves are the coolest creatures ever after Dragons, and I pretty much wanted to have at least a FF book to really look forward to read inthe future. But given that FF is now kinda back on a regular (stretching that word like crazy) basis, some brand new gems might pop up. So, I cracked this adventure and am having a blast. Its a shame its out of print of sorts, Scholastic might rerelease it next year, but i'm not holding my breath. This year we'll get Sorcery 2 and 2 other classic Livingstone/Jackson books. I think Caverns of the Snow Witch is one of them, maybe the second is Temple of Terror or Trial of Champions. The usual Livingstone line-up. Heard that there's a new Livingstone adventure planned for 2019, but that was recently just playtested, have no idea if the book will be out this year. But there will be at least 3 books this year, so that's good... or is it? Iif you are thinking of getting the new Scholastic reprint editions of the classics, I would suggest that you don't. Grab the new adventures if you're into it, but avoid this crap of reprint material. Why? They freaking redid the entire illustrations (yes, interior illustrations) and they could not look more bland and uninteresting and just s*it compared to what me and every single fan of these books in the world think of the classic artwork. Google the name of the guy (SAME DUDE did the entire line), I can't bother searching it again. What a disappointment that the 2 dudes with the power to do whatever THEY COULD with this line, went the cheap, cheap, s*it looking cheap way. FF me. At least, that dude who's ruining Fighting Fantasy for an entire generation of 2000+ kids worldwide (those who read books?) with his random "background in black, watered down/completely *SQUEE** version of a previous masterpiece" artwork, well, he won't EVER touch anything that is in those 3 volumes by Grandmaster McKenna. Oh, and a minor addendum to my previous post on Port of Peril: still haven't read it, have read the (expected) bad feedback from the blog world, but I'm still keeping an open mind. Problem is that this is a brand new book that is part of the new line, with the said crappatrocious artwork. I am willing to give Livingstone another pass and try it on a expectation-free basis, but if this is another Crypt of the Sorcerer with waaaaaay worse drawings to geek out, then is all I have left. Triple post, damn it- apologies again. Ok, so I finished Howl on my 2nd. This book is awesome. Just purely awesome. For context, I decided to avoid basically any path that I felt was doodoo from my first try, and went a completely different route. Completely. Different. To the point where some of the stuff I thought was a overall presence in the book (gaining lupine superpowers of sorts) basically did not affect my game. I found 2 of the Stuff needed, decided to go for the Bad Guy with plain old magical steel. Ah! I lucked out, since I ended the book 2 points away from death. EPIC!!!! So much to replay here, I saw some illustrations that realll make me try this yet another time this week. Great art, I mean GREAT art by Martin McKenna- perfect combination of the 3 most important things in a FF book to me: atmosphere, gameplay and artwork. Jonathan Green does an excellent job with the rules- man, there's some fun stuff here, and this is FF, the most basic of Gamebook systems. He added some new rules for certain individual creatures that are amazing in their creativity. Anyone remembers the Ice Demons from Caverns of the Snow Witch and Tower of Destruction where they hit you with an Ice Breath every round for extra damage? Those dudes have nothing on the Abbot-Maggot ( this gotta be my new favourite critter name) for an instant example. Really fun dice roll in this book. Hardest thing to do, imho. Atmosphere is PERFECT. I haven't enjoyed the writing in one of these this much since... geez, I can't remember anything from this decade, honestly. This is really one of the best books, and perhaps the most replayable one yet, because of the multipath thing to the win. There's so many possibilities to end this book in different ways and the side-quests alone are astonishing in that they take you away from the main one. You can't help to want to replay this when you take a look at some of the illustrations. Damn, this is a fantastic looking, excellently written gamebook. Grab a copy, if you can, it is REALLY worth the effort. Quadruple post, apologies if bothered. Ok, strong gamebook mood that I'm in, I decided to stroll around eBay to check for better copies of some of my most battered green-spined scrolls. What the serious FF, for yet another F joke. I know that almost 13 years after I started buying these online, some price spike was expected (remember that Wizard only reprinted 22 of the regular Puffins, the Sorcery! mini and 3 BRAND NEW adventures for a total of 29 books, not counting the SE Warlock hardcover celebrating the 25 years of the line). 37 of the OG books never saw a reprint and - bet you 100 GP on it - NEVER will. In the last 13 years, lots of more people started to getting back to their FF books, out of nostalgia. Among these came the speculators, taking tips from Jamie Fry's FF price guide. And things apparently got crazy along the way. I stopped buying FF out of 2 reasons: I had all the books I want, a bunch of them in 2 different versions even, and the last books I missed from Puffin's OG FFs were the REALLY EXPENSIVE ones aka The Last 5: #55 Deathmoor, #56 Knights of Doom, #57 Magehunter, #58 Revenge of the Vampire, #59 Curse of the Mummy. I have the luck of the portuguese translations with me, as in, some of these were (2 to be exact, Deathmoor and Mummy) easily available here- and the last book to be published (Mummy) announced Revenge as the next one, which never happened. THIS is the book I wanted- and want - most, since I am a huge fan of the late RPG Genius Carl Sargent*'s FFs. All of them. I love Vault of the Vampire, its a Tier 1 book, and the sequel while not being regarded as highly, is a must read on my list. I also LUCKED really, really big with my copy of Knights of Doom- cost me 5 GBPs and it is in GREAT condition. This is today a 100 euro book- I could sell this copy in 24 hours, easy. Eventually Mummy was reprinted by Wizard and - better - all of the errors were corrected. You can buy a copy of a Wizard edition of Mummy for like 3 pounds plus ship. The other ones are insane prices- Magehunter, I see 245 GBP as an asking price. It sells for less, sure, 100 GBPs for the last 2 sales, same with Revenge and Deathmoor. These were books with one printing, small on that and were done. They will only get pricier as time goes by. But Magehunter is a book by Paul Mason, one author I don't particularly like and it has a weird premise. I never felt like I had to get it, maybe one day if it comes cheap. Or cheap-er. For reference, way back in 2006, Magehunter was a 25 GBP book, and people snubbed the scalpers. "I will get it cheaper". No we won't. You can't find a copy in good condition (no HUGE defects) for less than 80 GBP, being very, very lucky if they pop. Time has passed, and the FF crowd is now way bigger than it was in 2002-2006. Ok, so on to another topic. I have been starting to finish my unfinished/unread adventures, tackled Daggers of Darkness last night, finished it on my 2nd try, 3rd overall since I died on this book years ago and never touched it again because it felt like what it is. A passable Fighting Fantasy book. Luke Sharp (pen/pun name for Alkis Alkiviades) kills me with his" throw a die. Throw another die. If the first die's result was higher, you die. F you." Or some variation of this. Like 2 dice instead of 1. Random, random, I do mean random dice rolls for life or death stuff, NOT taking into account your own stats. Like I said, its completely random. I hated his Chasms of Malice effort, felt like this "technique" was just unfair on the reader and the book went on forever. This is shorter, the plot is more interesting... i guess... at least Chasms had you start as a *SQUEE* rabbit-skinner, which I would JUST love to insert into my profesional CV. But his setting is on Daggers is interesting, for the most part. Think Mongolian fantasy. Some credit for the appparent multipath to victory, but I do wonder how much is multi. You DO NEED to have one item, at least. Overall, none of these Luke Sharp books has a "replayable for pure fun" quality. I still have to play Fangs of Fury, but will go for something better first- SORCERY!!!!!!!!! I haven't crossed the wildlands of Kakhabad in a decade, it feels. * Better known to FF readers as Keith Martin. Quintuple post, and by now, I already start to feel like I'm talking to myself, guys and gals. Almost 14000 thread views and so little content- c'mon, leave thy swords and backpacks alone for a minute and post some more stuff. Last thing I want is this turning into a solo thread... like a gamebook. But I bring glorious news from the realms of Titan. Glorious f*cking news, people. Until about 2 weeks ago I had completely forgotten about a book that was Kickstarted back in 2014, first in HC later in Paperback. The book is by Jonathan "21st century FF superstar and fan-turned-legendary writer of the line" Green. His is the book I am so lovin' right now, Howl of the Werewolf, along with other stellar adventures. I ordered a Paperback copy of it, arrived today at my hands. I wasn't this excited for anything FF in a long time. This is a book that in 2002, when I started reading these again, I would never think possible. FF was dead of sorts, although Wizard soon brought the line back. But the Wiz books... well, pages were written about how many of the old books never got reprinted. That's why we have Magehunter copies that are battered as a jeweler's door in Blacksand going for crazy bucks. Whatever. And they only published the 2 OG creators' books, a couple by the "Way of the Tiger" gents and the rest was all Jonathan Green. Oh, and Carl Sargent's "Legend of Zagor", written on the behalf of Livingstone. So many info is here, so many cool artwork, so many cool pics from 70s nerds and the old old-school of gaming in England, with that amazing pic of a huge line in front of Games Workshop's first proper physical store. This is a dream come true. infinite times cloud 9. It really is. It is a 270-something pages of a mastodon A4 book. All filled with everything that is minimally relevant to the history of the series: origins that go deeper than anything before, whole pages with exquisite classic and actual NEW artwork in places (check the Nicholson's Zagor or Iain McCaig's Zanbar Bone and the Bloodbeast from Deathrap Dungeon below- also, I can only post 3 pics at per reply), the evolution of the lore and how the other writers contributed in spades to the mapping of our dear old Titan's most inhostipable places. How cookie-addict-adventurer-scalper Yaztromo gained his name from a combination of the name of a 70s Red Sox Player (one "Yaz") and Alien's Nostromo. Steve Jackson at one time dissected rats for a living. The Citadel of Citadel of Chaos was chosen because of Citadel Miniatures, sold by Games Workshop (for those who have no idea, Warhammer and Warhammer 40k, Games Workshop' uber franchises only exist because of the same 2 dudes who started Fighting Fantasy, since it was Jackson and Livingstone who started GW). And again, A4 reprints of some of the most beautiful covers ever. Can not stress how much awesome this is- wait till you see the Forest of Doom OG artwork "Shapechanger" in A4. It is mindfreakingblowing. It is just that. Wow. We also learn that YES you are the same adventurer from books 5-7 of the Puffin line (Thieves, Deathrap, Lizard King) and these were the first books where Ian went for world-building. Kinda not so new news, but stuff like that is all over the book. I have so much to say about it, but will wait for the last page to make any more gushing. I flipped through it all a LOT and could not help to want start reading so many of the later chapters. I'm only on page 50 or so and can't wait to read the rest, but at the same time I'm taking my tie here, due to all the visuals involved. I will post some pics I took from my copy, just for you guys to have an idea of the thing. Front cover with Za(y)gor, Razaak, the Lizard King, Balthus Dire, Zanbar, a Great Demon on the back row (from Dead of Night) and the Night Dragon also on the back. At front, undead and Goblins/orcs, etc. The back cover - forgot to take pic, sorry, but its easily googable - has Shareella, the Snow Witch along Sukumvit and the Archmage. Cameo appearances bya Haggwort, a Brain Slayer and a Bloodbeast. All VIP stuff, these folks. Then, one other bonus NEW illustration from Russ Nicholson- Zagor, the original villain. More pics on the post below. 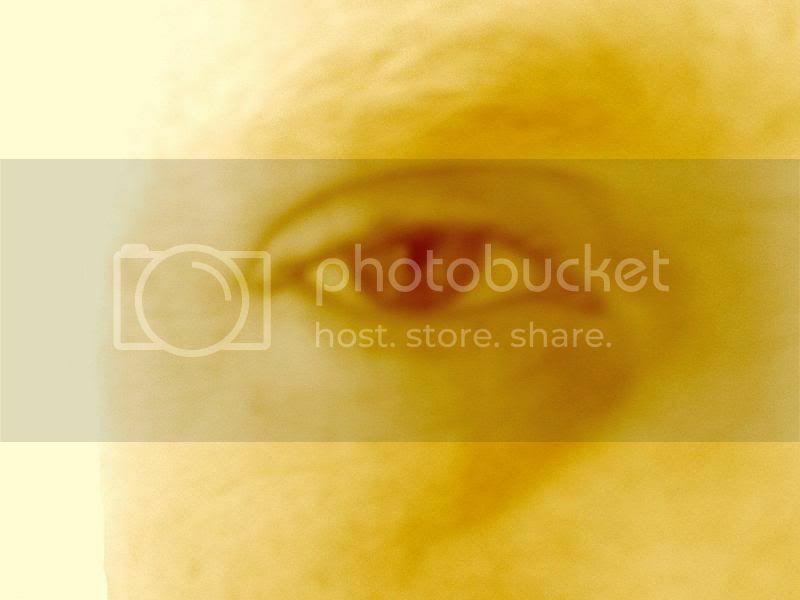 Last edited by ShadowTuga on Sat Feb 09, 2019 11:42:51 pm, edited 1 time in total. Ok, as I said in the previous post, here's my final thoughts on YOU ARE THE HERO, the book on the story of FF books. This belongs in the shelf of any fan of the genre, let alone FF. Its simply a must-have item. Details/behind-the-scenes stuff related to the original line are on the hundreds; artwork... just wow, so many great pieces here; the color maps by Leo Hartas are a huge bonus for me, since most of them I had only in B&W, and some were removed from later editions of the books- and they never looked better in this shiny paper; there's a whole section dedicated to sci-fi FF and why it is so "unliked" by most of the fans, then and now; lots of info on the never-published/never written books that might have been, and this is a treat- I still hope that one day, Stephen "Fury of Dracula" Hand will be in a good mood and let his work be republished again, along with the Blood of the Mandrake final book for his perfect, PERFECT mini-series of (so far 3) FFs, and that mysterious Smuggler's Gold idea that he still won't say what it is. There is a chapter dedicated to the fandom itself, and throughout the book, several greenspine-adventurers talk about their likes and dislikes, a very cool addition. There's even one gent (one of the KS backers) from my country that has something to say about the above mentioned sci-fi books, and on that, of course there's a whole lot of foreign FF covers around. This was a global phenomenom, after all. Also, every 2 pages or so we get a BIG version of a cover without the lettering, just the art. I can not tell you how many times I had the "geeks" real hard looking at these. 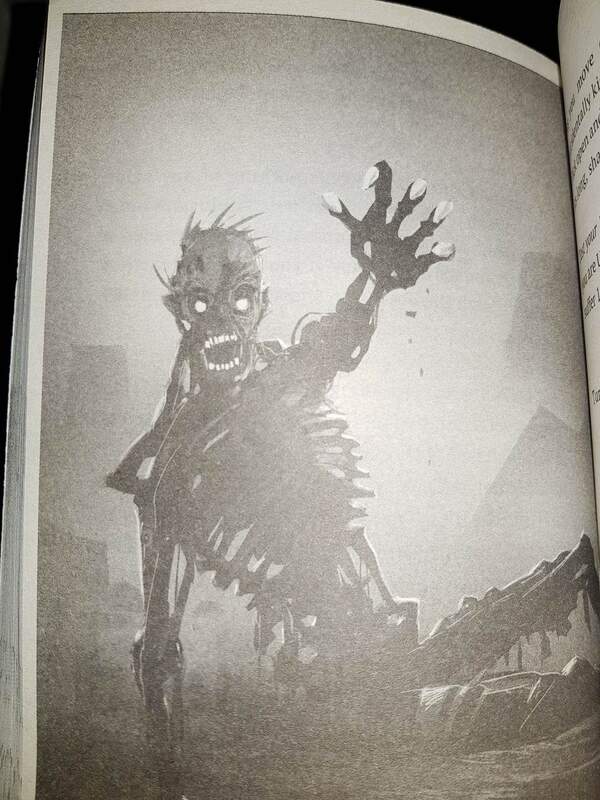 My A4 copy of Out of the Pit does NOT have the color illustrations (I suspect they were ripped from the book, since they are advertised on the backcover), and this was the 1st time I saw the Forest of Doom Shape Changer in all of its A4 glory. And even some "quieter" covers look waaaaaay better in this size and format- Midnight Rogue for example. We get info on the several attempts at videogaming and movies. Kinda mandatory in a FF history type of book, but it is the weaker bit, despite being entertaining to read, since its FF. Huge KUDOS to Jonathan Green and everyone that made this book possible. It is a treasure of nostalgia-filled content, and I devoured it in 2 nights, despite the 270something pages. For any die-hard FF fan, this is a dream come true. Get your copy while they are available. Ok, now I feel I have to post here whenever I do anything related to gamebooks... so be it. Thanks for reading and hope I'm not too much of a thread-eater. You can always ignore. A couple of nights ago I finished one of my books that I haven't played in a while and never finished before. Black Vein Prophecy, by Paul Mason and Steve Williams. Cover (meh, at that) by the usually Great Terry Oakes. 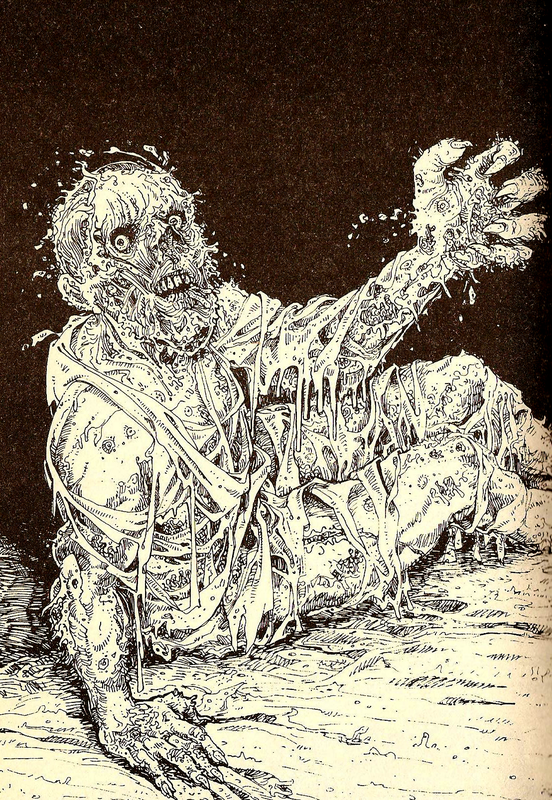 His interior illustrations are vastly superior and is mostly innocent of the cover-fiasco since he was taking design hints by one of the writers (Mason, I think), who admitted his bad directions. The book is shrouded in mistery, you have 0 idea on the quest, who you are, where you are, etc. This works well, and while it is not as fascinating and... well, good, as Creature of Havoc - that used this same trick earlier in the series - it is very well written, and the Weird is strong in this part of the book. Wax-sealed catacombs, unusual headaches, voices, lights, Luck tests that are unfair to any player, and there's a guy+horse multicolored thing that speaks to you (via horse's mouth) and you don't understand s*it of what he's babbling about. It is a surreal-medieval take of fighting fantasy. Great stuff. And after this part of the book, its dungeon/outdoors adventure at its basic, with some other novelty here and there. Its not as good, by any means, and the mistery is "ruined" after you encounter a Nice Wizard Guy who tells you all about your quest. Ok, this was worth it, but I had to do a lot of stupid, unreasonable *SQUEE* just to get me in the right track. Like letting myself being carried by a bloated giant bird thing, or discovering that my bad luck (see below) payed off in ways of me becoming a mutated sort of adventurer. I am also now pretty good with Magic, so I can forgive the -2 penalty at deducing my initial Skill. The ending is absurdly difficult- it is just insane. I remember 3 paragraphs each with 4 instant deaths as possible options. D*ck move, Mason & Williams. The downs: unfair Luck test that you have to FAIL in order to complete the book. Almost right at the beginning. This is one of the stupidest gamebook design flaws ever. You might be honest and have a bad initial Luck score, but you'll need a good Luck score also, later in the game. Just stupid unfair. Also, the final battle, it is impossible for someone to be THAT lucky in choosing the right spells. Lots of trial and error, but at some point you might be tempted to just cheat and choose the right one.The book fails to engage you overall, and that's a big downer. 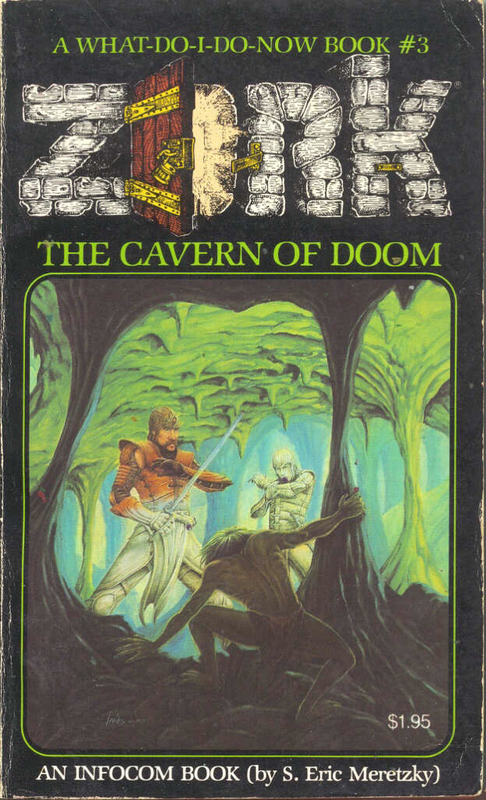 An above average gamebook that actually could have been waaaay better in the series, if not for the game mechanics' dept and the "ok, i guess" bit between being catapulted and finding the Nice Wizard. Not playtested enough before release, and it appears the writers lose interest during some of the set-pieces, and things feel like a game, instead of a gamebook. Oh, and Velkos.. wtf?! Tonight I ended up a string of 4 evenings dedicated to help the good people of Analand and go through 4 books in order to retrieve the Crown of Kings, a very special thing in my parts, apparently. In normal human language, I finished playing Sorcery! by Steve Jackson, and perfectly illustrated by GW Genius, Sir John Blanche. I haven't played the EPIC in its entirety in a looooooong time, to the point where I had forgot some of the TERRIFIC moments in this 4-book series. I can post my maps/doodles/solutions later, if anyone asks. For now, my thoughts on each, SPOILERS will be hidden, but first my overall take on these amazing gamebooks. The gaming system is as good as FF gets, bar none. I usually say that while Creature of Havoc or Legend of the Shadow Warriors might be the greatest single FF books ever written, the Sorcery! series on its all, has no rival. It is a masterpiece of gaming solo, with a unique, so far unmatched imho, Magic system that makes you study and memorize spells, like a real Wizard would do. Its so much fun to avoid fight situations by making your opponents dumb as rocks or turning them into actual rocks themselves! It pays off when you already master the system to the point where you feel that, unless lack of a certain item needed, you have a magical defense for everything. Almost, at least. The series format of the books (it's a campaign, where you start a book carrying everything from previous adventures) turns it into the Epic of the line, with an ending that will leave you kinda sad that it is over. Let's play it again! The intro and by far the easiest of the whole series. Great atmosphere, awesome set pieces and NPCs to find, and it feels like a preparation for the future books. I adore the trekking aspect of the book, where one is looking for villages due to necessity in order to avoid sleep in the wild. 2. "Kharé- Cityport of Traps"
Damn, this was going to be an easyish journey, one might have thought at the end of Shamutanti, but this book will get you in line. Hard to beat, but so much fun to explore in this haven of trash critters, killing each other for a copper piece. It has an incredible atmosphere, again, but this town actually feels "real" in points, due to the variety of things abound that you come across. I fought a hacked-in-pieces Living Corpse and I also got stoned in "smoking weed" with Back Elves, nuff said. Maybe the less "atmospheric" of the books, but the gameplay is exquisite. I did the optimal path, trying to kill every one of the baddies- payed off really nice in the last book. 4. "The Crown of Kings"
... and the final chapter. So much coolness in this book, really hard to pinpoint a couple, but the She-Satyrs, the Samaritans or Naggamanteh are just memorable stuff for the ages. But the biggest "wow" comes with the "ending". Nothing like this in any book that I know of - and if you are stupid you are "rewarded" by it, by being transported back in time to the PREVIOUS books. One of my favourite moments in this whole line of gamebooks! I am gonna try to map all of the Old World gamebooks in my next readings (thinking Vault or Shadow Warriors), so more to come. Alright, now I am even quoting myself. And I did as I said. Yesterday I finished Vault of the Vampire and tonight it was Legend of the Shadow Warriors. Two of the finest books in the FF series, both set in the Old World with its Hammer-horror vibe- in fact it was Vault that set the mood, and Stephen Hand's followings just made this corner of Titan the most interesting of all, imho. I explain: Allansia will always be a dear in my heart because of nostalgia and the memories I have from my childhood trying to beat the classic books. But Allansia is pretty much generic fantasy setting, as in, you have your dungeons abound, thousands of orcs and goblins to be killed and then some and you can always count on a evil wizard to make you go and steal his loot/stop his plans of bwhaahahahaaha!!!!!! Its nothing that you haven't seen in other RPGs and the fact that both Ian and Steve were D&D geeks means there's a loooooooot of monsters that you might encounter in Faerûn or Greyhawk (Ian also contributed to D&D's Fiend Folio 1st Edition which means some of these are actually his creations); this to say., that Allansia is the most "generic medieval fantasy" of the 3 continents of Titan. What a detour. Anyway, on the other Hand , there's the Old World. What a place. Simply put, the books that are set in this continent are among the best (and you can add Sorcery! to that list) of the line. The Old World is far mored advanced (or just more advanced...) than Allansia because of it s relative peace. Kingdoms are actual kingdoms not some city and its walls, and there's a political atmosphere that makes the stories even more intriguing. Science or pseudo magic-science is more developed than in anywhere else and you can actually find Mad Scientist types with machinery that evokes a more steampunk vibe. That more developed. So on to the 2 books. Vault of the Vampire is a traditional FF but benefits from being late in the series of sorts (38) and therefore the gameplay is way more well developed, with new stats and tricks for the players. When I say traditional FF, well.. it's a Vampire-Bad-Kill-it Adventure, just take a look at the cover and title. But Castle Heydrich is no rushed work of dungeon design. While a bit "straight" in lack of a better word, it does give you lots to explore. The atmosphere is fantastic, you feel you are in a Vampire castle and you are facing actual, real menacing beings (Heydrich has Skill 13 Stamina 21, i.e. F U Adventurer). The family members add a lot to the story and everything in the castle makes it a scary place despite its beauty. Great writing by Keith Martin (Carl Sargent), and this is one of the best FF adventures, certainly top 15 or 10. As for Shadow Warriors... this is one of the top 3 books in the series, at least to me. It takes place in a earlier era of Titan, and you play a veteran of the War of the Four Kingdoms. Along the way you'll find subtle and not so subtle references to your character's past and this is an awesome addition. Wulf! Anyway, the mission seems again, rather linear- 5 Bad Dudes trying to ressurect Badder Dude, you have to stop them and deal with the Badder one. There's not a single moment in this book that is a meh or rather "usual" encounter. Everything in this adventure is just amazing. Mandrakes, Haggwort, the Shadow Warriors and the Bad Guy are top favs, but honestly, even after finishing it, you will want to play all the wrong turns in this book because there's always something wow to be discovered. Oh, and using the mirror in Gornt is one of the best things ever in a gamebook I read. I can not spoil it, I really can't. If you are to read this book, you have to go to Gornt and check it out for yourself. Mindblown. This was my first "new book" that I read when getting back into FF, and it still remains one of the very, very best. A classic, and I can not reccomend it enough, along with Moonrunner (my next mapping effort) and Hand's co-written Dead of Night.